I enjoy looking at and thinking about the graphic design of tight spaces: wine labels, logos, business cards, Field Notes notebooks, book covers. The mandatory elements, layout, unity, balance, typography, color, how the designer gets my attention and directs my eye and avoids cliché (maybe) while making the essential allusions and signifying at a glance. All of it fascinates me. Which means I lapped up Jo Lou's "What Eleven Books Looked Like Before the Final Cover," published by Electric Lit. Lu talked to a near-dozen designers about their work on recent books, not just the final covers that graced the books in stores, but earlier designs that did not make the final cut. Each designer explains how the designs evolved, what was wrong with the rejected covers and what was right with the final versions. One of the more interesting aspects, to me, was how various external influences affected the designer's thinking. David Litman had to change his thinking about a new cover for a reissue of Ray Bradbury's Something Wicked This Way Comes because the publisher wanted it more of a piece with a recent reissue of Fahrenheit 451. Nicole Caputo worked on the cover of Karen E. Bender's The New Order (at top), a collection that includes stories about violence and a school shooting. While Caputo was working up her design, the Stoneman High School shooting occurred and Caputo successfully lobbied for an upsetting image of an overturned school chair. 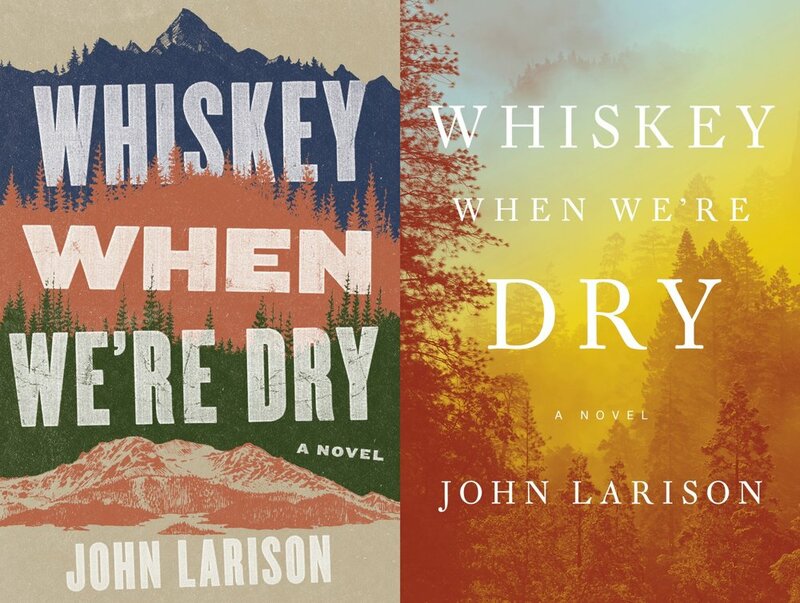 In two cases, I preferred one of the rejected covers, as with Colin Webber's design for Whiskey When We're Dry by John Larison (right). The final version is on the right, but I like the left one much more.